Truly the fairest in the land, Snow White is a kind and gentle soul whose beauty incurred the wrath of her Evil Stepmother, the Queen. However, little does this Princess of Heart knows that she faces a danger far more threatening than petty jealousy. When her world fell into darkness, she became one of the first Princesses to be kidnapped by Maleficent, and her heart was extracted both to open the Door to Darkness and to forge an artificial Keyblade. Snow White awakened from her slumber when her heart was restored, and together with the other Princesses pooled their power together to hold back the darkness flowing out from the Final Keyhole, though the effort drains her of her energy. After the Keyhole is sealed, she patiently awaits Sora's victory in Hollow Bastion, hoping that her loved ones are safe. One of seven maidens who possesses only pure light in her heart, Snow White's physical and spiritual beauty has caused the Magic Mirror to deem her the fairest one in the land, immediately making her the target of the Evil Queen's jealousy. While picking flowers in a glade, she encounters Terra, who has been tasked with killing the young princess. Though not at all startled by the strange figure in her midst, she is nevertheless frightened when Unversed converge upon her, and flees into the woods. She became the victim of the Unversed pursuing her and was at the mercy of her own terrifying illusions until Ven comes to her rescue, and with his help, she eventually finds a sanctuary with the Seven Dwarfs. 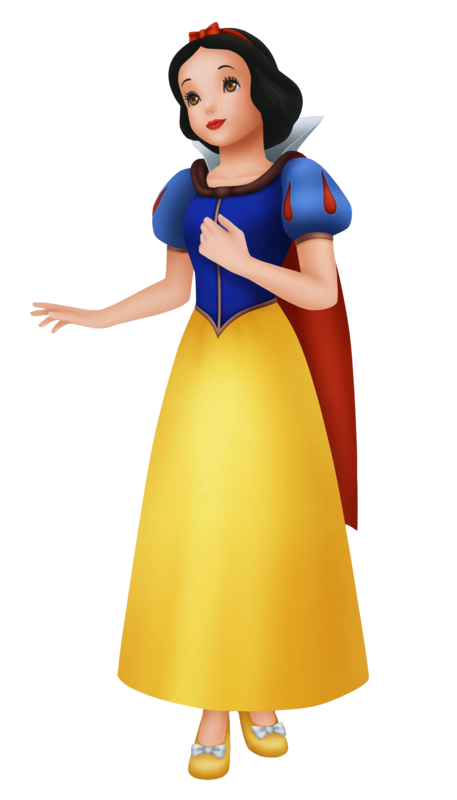 Shortly after, Snow White is tricked by an old peddler woman (actually the Evil Queen in disguise) into eating a poisoned apple, and her body was lain to rest in a glass coffin. A kiss of true love from her Prince manages to conquer all; together, she and her love begin a new journey towards their happily ever after.